In the market for a new Wi-Fi router? You may want to wait a bit longer. 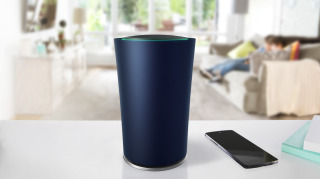 Google is rumored to have one in the cooker for its October 4 Pixel phone launch, which may seem odd considering it already makes the OnHub router (pictured above). Sources tell Android Police, however, that this new router, dubbed the eponymous Google WiFi, will cost $129, or about £99 or AU$169. While not the cheapest on the market, that's still pretty darn inexpensive, and less than you'd pay for the $179 OnHub. The deal gets even sweeter when you take into account this nugget: apparently the router can connect multiple access points and turn them into a one giant wireless network. This so-called mesh networking basically links different networks together so they blanket an entire home in a single super network. Routers like the eero already do this, but a single eero costs $199 (about £155, AU$265), or $499 (about £385, AU$655) for a pack of three. The Google WiFi router is also rumored to have some smart features, though specifics on what those are sparse. It's also rumored to have an enhanced range over other routers, though that's a common brag in the space. In addition to Google WiFi, the search giant is also expected to reveal the price of its Google Home hub at $129, a new 4K Chromecast Ultra, and the Pixel and Pixel XL smartphones next month. TechRadar will be on the ground at the event, so stay tuned for word on all that Google has in store.